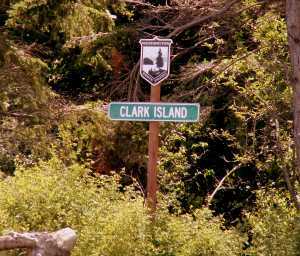 Information:C In the northern San Juans is a small, seldom-visited marine state park -- Clark -- a 55-acre marine camping and moorage park with 11,292 feet of saltwater shoreline on the Strait of Georgia. 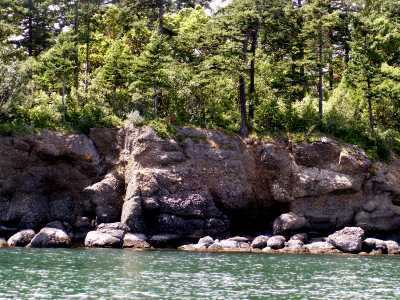 This is a popular kayaking site, providing an important camping and rest site for paddlers traversing the northern San Juan islands. -----Although distant, the geology of the island is fascinating and uniquely different than the islands in the southern San Juans. There are two picnic sites on the west side of the island. The east side has beaches of smooth pea gravel. Access: -Only by boat. Clark State Park is difficult to access, since there is no dock and there are strong tidal currents that discourage anchoring -- but it is worth the effort. 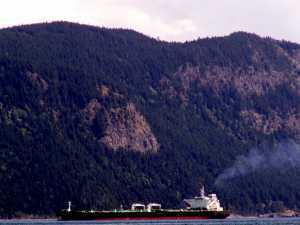 -----The east side moorage area is subject to large waves created by passing commercial shipping in Rosario Strait. CThis park is located in the southern Straits of Georgia, and is subject to very strong currents, winds and waves. There is no dock and Douglass recommends against anchoring due to the vulnerable position of the island. 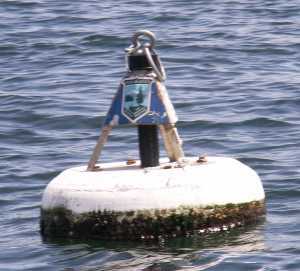 The state has provided several moorings, however, so visitors can tie and use their dinghies to go to shore. CThe geology of the island is interesting, since it is very different than most of the other San Juan Islands, but similar to those on Sucia and Waldron. The rocks are mostly conglomerate (a mess of rounded pebbles and boulders cemented together -- like a rough cement job) and sandstone. cAbout 75 my ago, near the end of the Mesozoic ('middle life age' and the end of the dinosaurs), there was no Vancouver Island and this region was the edge of the continent. Large rivers poured off the land carrying gravel and sand. This built a large delta against the continental margin, much like the delta of the Mississippi River in Louisiana today. Slowly the deltaic beds hardened into rock layers of conglomerate and sandstone. cThen, about 40-50 million years ago, an island mass of continental rock appeared on the western horizon. The sea floor plate that had been sliding under western North America for tens of millions of years continued its eastern motion bearing the island mass steadily to the east. As the sea floor plate slid under our continent, the island mass of (relatively) lightweight rock crunched against the rock of the lightweight continent, crushing the intervening delta sediments. The result: the newly accreted island mass now known as Vancouver Island. 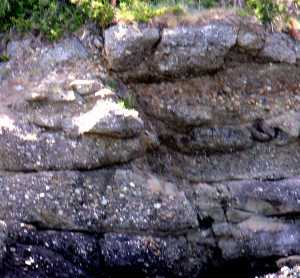 The crunched delta rocks comprise the northern San Juan Islands (Sucia, Waldron, Clark) and Canada's Gulf Islands. The northwest-southeast trends in these islands are the result of the rocks folded by the impact of the collision of Vancouver Island. 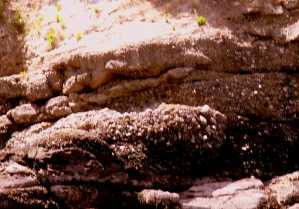 Faults commonly disrupt these beds due to the pressure exerted on the brittle conglomerates and sandstones. CThe remains of critters that lived in the estuary are found throughout this northern region, but are best known at Fossil Bay on Sucia Island today. CContinental ice sheets have covered this region at least twice, carving out valleys from the softer rock and and leaving long ridges where the harder beds resisted ice erosion. As the sea level rose with the melting of continental ice caps, the valleys were flooded as narrow bays and the ridges stand as long parallel islands. CBecause of the relative isolation of Clark Island, we recommend visiting Sucia, with its fine facilities, if you wish to observe these beds.